Star World 4 is the fourth Star World level in the game Super Mario World which is accessible by the Star Road located west of the Forest of Illusion. The level takes place in the sky at night and features a rare red-colored Baby Yoshi. 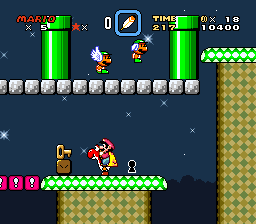 Star World 4 consists of one long screen, which the player has 300 seconds on the Timer to complete. There is a ? Block halfway through the level which contains a Cape Feather if Mario or Luigi are big, and a Super Mushroom if they are small. This level did not contain any Dragon Coins in the original SNES version; however, the Game Boy Advance remake Super Mario Advance 2 adds Dragon Coins to the level. Like all Star World levels, there are two ways to beat the level. The player will start next to a red Yoshi Egg which will hatch into a red-colored Baby Yoshi once the player gets close to it. If the player has a cape, the player can fly through the entire level. If the player has no cape, they will need to progress to the right while avoiding Koopa Troopas and Winged Koopa Troopas. A little less then halfway through the level is a ? Block with a power-up for the player. There are also a few columns of red Winged Koopa Troopas to avoid. Three-quarters of the way through there is a blue shell-less Koopa which will kick a Shell at the player. The player can also have Yoshi eat a Blue Shell and fly through most of the level that way. To find the Key and Keyhole, the player should already have completed the Red Switch Palace and Green Switch Palace, however it is possible to jump off the green platform directly after the area with the pipes and float backwards underneath it as well. The player will also need a Shell or cape to hit the ? Block containing the Key next to the Keyhole. To get to the platform where the key and keyhole are, the player should drop down onto the green ! Blocks located below the part with the orange pipe and continue right onto the red ! Blocks, then hit the ? Block next to the Keyhole for the Key. Beating the level this way will allow easy access to Star World 5.